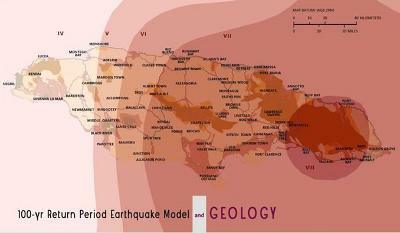 An earthquake simulation model for Jamaica. Mona GeoInformatics Institute and the Earthquake Unit at the University of the West Indies (UWI) have developed an earthquake risk model for NEM Insurance Company Jamaica Limited, says NEM’s General Manager Chris Hind. The model aims to determine whether NEM has adequate reinsurance coverage to cope with a 7.0 magnitude earthquake, similar to the one which struck Haiti in January 2010. Hind said such models are valuable to general insurance companies to ensure they have adequate coverage in the event of a disaster. Deciding how much reinsurance to buy and where to set event limits is thus crucial for a general insurer to operate successfully, he pointed out. However, such decisions have traditionally been guided by the output of international catastrophe models. “Unfortunately whilst these models are sophisticated and widely accepted, they have limitations when it comes to accurately predicting the impact of catastrophes on small Caribbean nations such as Jamaica,” Hind outlined. The companies that develop the models have sketchy knowledge of local conditions and have not spent the time and resources to develop a detailed understanding. “For them, Jamaica is not a lucrative market for catastrophe modeling,” he stated. Therefore, locations, such as the South Eastern or Western United States get their attention, because there is much more value at risk. In December, Dr. Lyew Ayee, Director of Mona GeoInformatics, worked in concert with Dr. Lyndon Brown, head of the Earthquake Unit at UWI, to create a model that simulated the Haiti Earthquake along the Enriquillo-Plantain Garden Fault at the worst possible position for Jamaica. The focal point of the model earthquake was set at Ness Castle-Arntully, in the foothills of the Blue Mountain range. 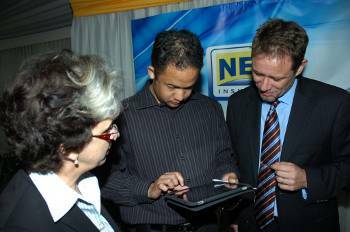 Dr. Parris Lyew Ayee (centre), director of Mona GeoInformatics, discusses Jamaica’s first indigenous catastrophe simulation model with Chris Hind (right), general manager of NEM Insurance Company Jamaica Limited, and NEM’s deputy chairman, Kathy Moss. The model demonstrated that the company’s reinsurance provisions with overseas providers would adequately cope with such a disaster, as well as a second catastrophe in the same year, Hind said.